Emerald Rangers: Horizon Chase Turbo (Playstation 4) Review. I love racing games but I do wish that we got more stuff like the arcade games I grew up with. You know, Daytona USA, Sega Rally, Outrun. Yeah, I really crave something that's like a Sega arcade racer but with an original twist. This game looks like that it ticks those boxes and I sure hope that it's a good game to boot. 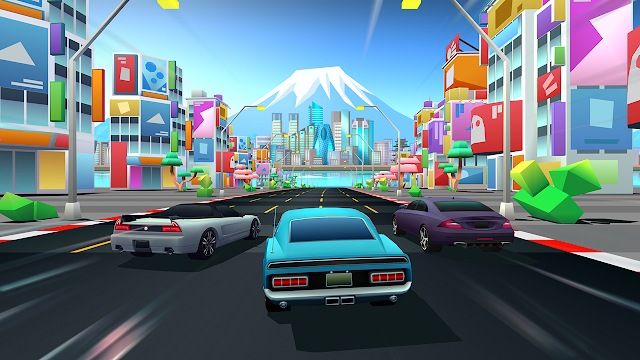 This is Horizon Chase Turbo. (Click on "Read More" to read the full article). This game doesn't have a story nor does it need one and I have no problem with that. Gameplay in this is what you'd expect from a racing game, your goal is to simply win races. Controls are also what you'd expect, you'll have no trouble adapting. The small things that this game does differently compared to a lot of racers is that you have a fuel tank that you'll need to be kept an eye on. Fuel can be refueled by collecting gas canisters found on the tracks. You do get nitro that will give you a huge boost of speed and it always feels so good to use. This game may play like a standard racer but it's also much more than that. The people behind this game did their best to make this racer feel special and unique by making something that's not just reminiscent of old arcade racers. Devs also did their best into making this a super fun game and the fun factor is huge. 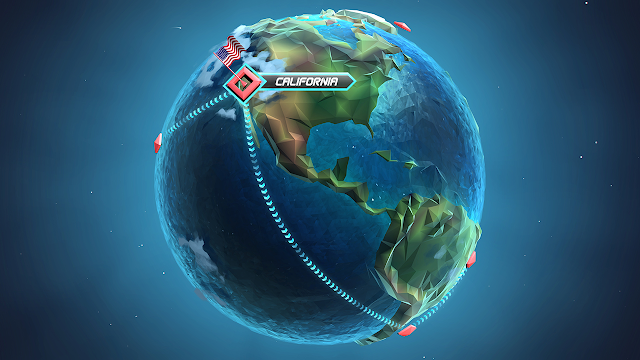 The main mode has the player racing all around the world in countries such as Japan, China, Australia, India, Finland and the good ol' US of A. All of the tracks are also based on real locations and are all designed really well. 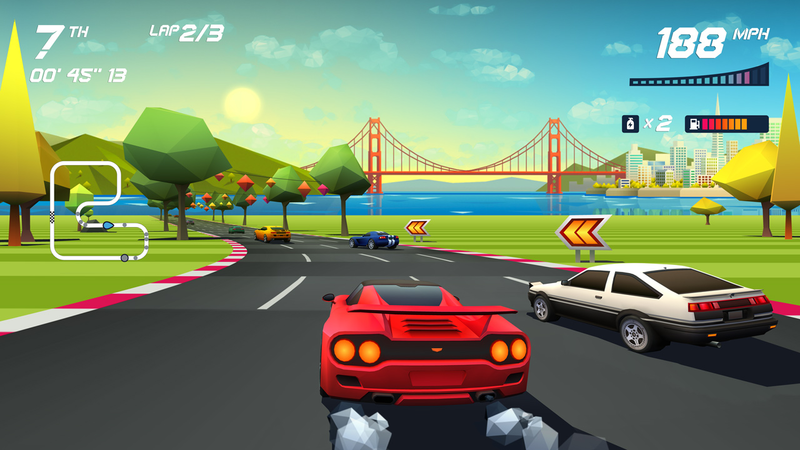 You won't have access to all of the tracks right away, you'll have to unlock them by winning races and earning points. Most of the tracks also have blue coins that'll need to be picked up and they don't just give you points, you'll need to collect them all and come first in the races to earn a special trophy. 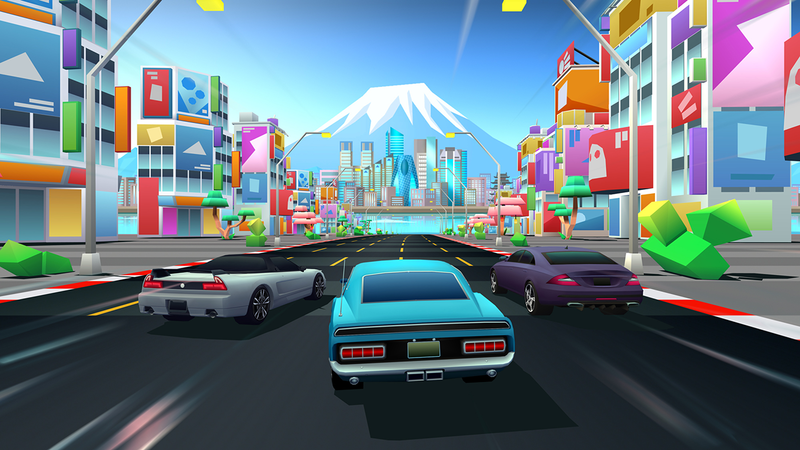 There are also special races that can be unlocked on each country and if you win, you'll earn special upgrades for all your cars. It's not just tracks that can be unlocked, cars and modes can be unlocked as well. 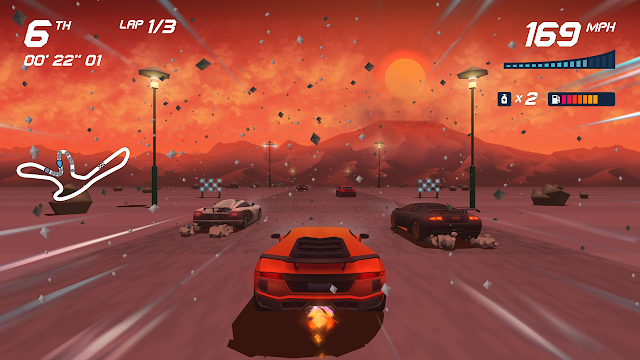 Most cars can be unlocked though gaining points that you get by winning races. Each country has a super special car that can be unlocked. In order to get those you'll have to win gold trophies in all the races in that country. All of the cars have different stats and each car really does feel different. My favorite feature regarding the cars is that if you hit the touchpad during a race, you'll hear a car horn sound come out of your PS4 controller. Each car also has a different horn and that's some incredible effort put into the game. The devs could've easily just had one horn sound or not even have the horn feature at all. The main problem with this game is that during the start of every race, the tracks get way too crowded because there are so many cars in the race. I haven't had a single race where I didn't crash into anyone because there was no way of passing them. I could just use the breaks and wait for an opening but if you do that, they just zoom way too far ahead of you and it'll be hard for you to catch up. Using the breaks is a very dangerous thing and it's a good thing that not many tracks require the use of the breaks. The crowds do thin out once you get really into the race and being a head of the pack (AKA being at first place) feels so satisfying, it makes me feel alive. Winning is incredibly satisfying and rewarding and not an easy thing to achieve. There's quite a bit of challenge and you will need to make use of both your speed and skill. Losing races will make you rage but it also won't discourage you from playing and I did indeed kept on playing despite my many loses. Why? Because it's a flat out fun game that filled me up with a lot of joy. There are some things that weren't in this game that I would love to see. One thing is a mode that ditches the fuel feature and adds a timer to make this game feel like Sega Rally or Daytona USA. The other thing I would've liked is a time trial mode that ditches the fuel and other racers and let me drive on the tracks as a solo racer. All of the levels are very awesome and I really want to just drive on all of them without the fear of seeing another racer so I can enjoy the scenery. This game uses 3D graphics but instead of using them to make the most graphic intensive looking game, they did something much more creative and much more refreshing with them. What they did was make this game look like an old school Sega 2D racing game. But Kaisey! How did they do that with 3D graphics? Okay, 3D graphics does sound like that it'll harm the authenticity but they did an excellent job with them. 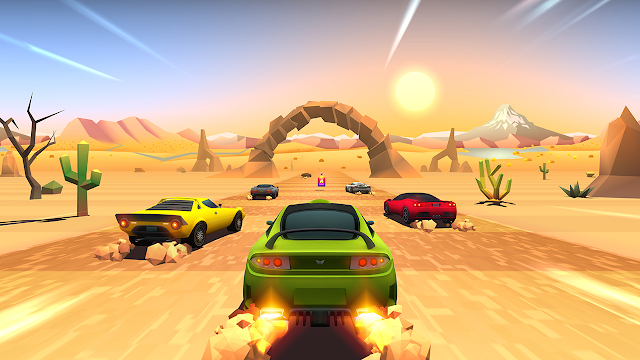 Sure, the 3D cars do stand out but the track design and coloring does indeed make this game feel like a racer from that era (and also Space Harrier). It has got to be the most clever use of graphics that I've seen since cel shading and Paper Mario. If these graphics don't impress you then you just won't be impressed and I won't give you any hard feelings about that. I also like how some races take place at different times of the day and in different weather. Not only does it look good but it does factor into the gameplay and adds a new challenge. Dang! I love the detail put into this game. I really adore the car design, especially the ones that pay tribute to cars from movies and TV shows. Yup, a lot of fanservice is found in this little racing game (proper fanservice and not jiggly anime kind) and it brings a guy like me a lot of joy. I am glad that this dev didn't just rely on the graphics to sell this game and like I mentioned before, gameplay is top notch. The soundtrack in this game doesn't sound terrible and it does use a style of music that you would find in old racers. I did like how each country got their own versions of some of the music with the style matching up with what kind of music style that country is most known for. I wouldn't say that the soundtrack blew me away, it did come off as a little generic but it really went well with the game and that's all that counts. Overall, Horizon Chase Turbo is a good neo-retro arcade styled racer... A really good neo-retro arcade styled racer. It takes everything good from the old and modern racing games and creates a really satisfying and fun game. 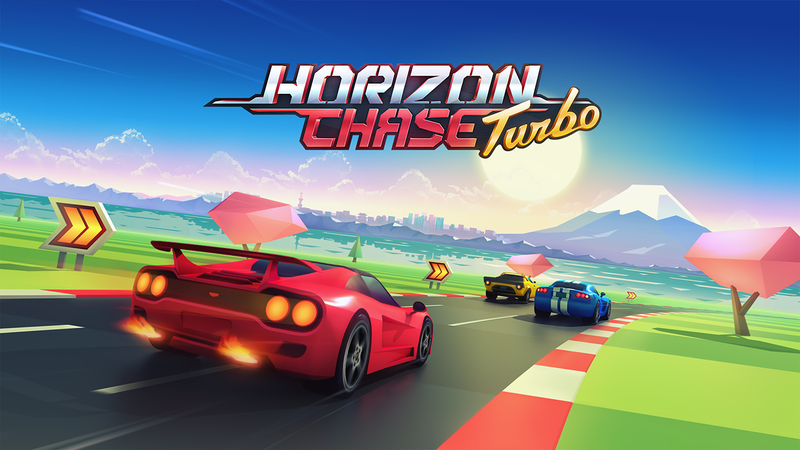 Horizon Chase Turbo gets an 8 out of 10.